In October 2018 a total of 13,794 new motor vehicles were registered, of which 9,682 were automobiles. 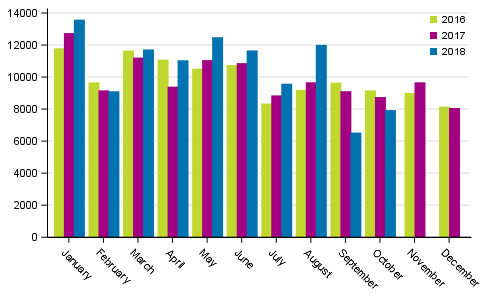 First registrations decreased by 0.3 per cent from the corresponding month of the previous year. In October the number of new passenger cars registered was 7,935, which was 9.3 per cent down from the year before. The number of first registrations was affected by the new WLTP measuring method for emissions introduced at the beginning of September. The share of new diesel-driven passenger cars was 27.0 per cent. These data are based on the Vehicular and Driver Data Register of the Finnish Transport Safety Agency and they have been produced by Statistics Finland. The numbers are exclusive of the vehicles on the Åland Islands. In the January to October period of 2018 a total of 166,982 vehicles were first registered. Compared to the year before, there was an increase of 2.7 per cent. The number of passenger cars first registered in the January to October period was 105,670, which is 4.8 per cent up from the year before. The most common passenger car makes first registered in the January to October period were Toyota, Volkswagen and Skoda. ISSN=2342-365X. October 2018. Helsinki: Statistics Finland [referred: 19.4.2019].